‘’If at first you don’t succeed, then try and try again’’…. 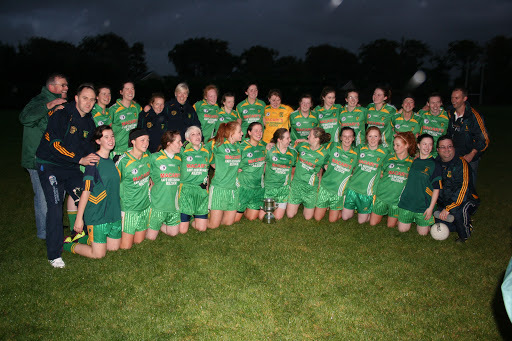 This was definitely the never say die attitude of this bunch of ladies as they finally claimed the elusive junior b championship after a nail-biting final against Kilcullen at Sallins in September. The bulk of this team had been denied in heart breaking fashion twelve months previously, when defeated by Carbury, while players such as Fiona Campion, Linda Byrne, Sheena Byrne, Therese Macken And Bernie Durkan had also tasted defeat in ‘03’, losing out to Na Fianna. In hindsight this year just gone out always had the feel about it that this team, mixed with perfectly with youth and experience, would do something special. But these things don’t happen just because you think they will, they happen through great work and endeavour from everyone involved. 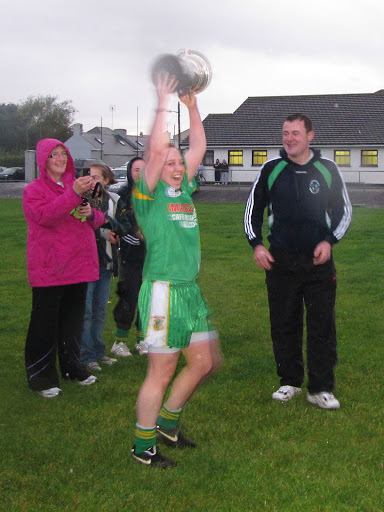 And not to sound repetitive to last years’ report but the reason this team got to where they wanted to, stems back 10 odd years ago when the underage was set up and boy are they reaping the benefits now, with the latest crop including talent such as Emma Maguire, Caoimhe Fagan, Grace White and young player of the year elect, Aishling O’Connor!! The job of mixing all these ingredients together fell on the shoulders of incoming manager Shane Stone and his selection team of Seamus Kane, David Hynes and Robert Cox. As it happens the year started out with Stone and his backroom team double jobbing, with them also in charge of the minor team that made it all the way to the final only to be beaten by a very strong Athy team but who will ever forget their epic semi-final win over Leixlip in their own back yard on that cold, February night. This run to the final helped all involved as it meant the minors trained with the seniors right through till March/April when they were all put through their paces in the GAA hall with many a sit up and squat done along the way. It wasn’t all training though and the key to a successful year to come was probably in the numerous challenge games contested and won, against tough opposition such as Skryne, Summerhiil and Walterstown from Meath and Celbridge, twice, from Kildare. In this time it was deceided that Shona Cagney would stay on as captain from 2010 and with all the pre-sesaon preparation in place, it was time to tackle division 3 of the league head on! Unfortunately after all the hard work and preparation, the girls didn’t make the best possible start to the league, losing at home to Kilcullen but that was to be the first of only two bumps on the road in the group stages as they recovered to beat a fancied Ballykelly side 2:06 to 0:10 in round two, in Ballykelly. Na Fianna were next up, back at Kilcock and the girls made light work of them, whilst chalking up and impressive scoring tally along the way, 1:15 to 1:06. While the forwards may have been getting all the praise in these early games, they can thank their defence for been in a miserly mood throughout, rarely conceding more than ten scores as Moorefield were to find out both home and away, the home score been practicularly impressive as the ladies ran out convincing 3:20 to 1:02 winners. Na fianna away proved to be one of the girls more hard fought victories, but they showed a character and determination that night that said to me this bunch of players were ready to take that next step, ready to pull a win from the jaws of defeat, as they did, coming from behind to win 2:13 to 1:13..Another big win was just around the corner, this time beating Kilcullen away by 3:14 to 0:10 and they rounded off the round robin stages by firstly receiving a setback, losing away to Athgarvan before defeating Ballykelly and the former, both at home. All this meant that a semi-final beckoned and as Stone’s troops topped the table, they would be due to play the fourth placed team and have home advantage in doing so. beaten twice in the group, but the Ballykelly side that turned up to Sallins that night, meant business, they were out for revenge and would go through anyone to get it and right from the off they dominated a shell-shocked and youthful Kilcock side. 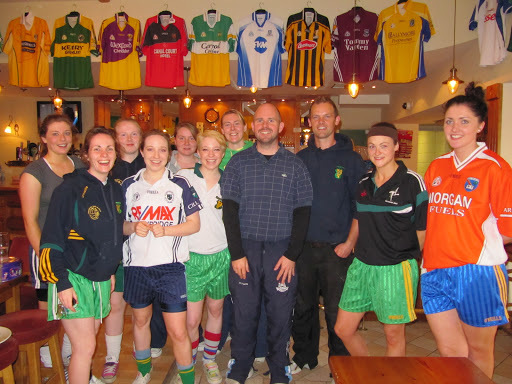 You just can’t prepare for that, the girls trained harder than ever in the build up to that final, they had Dermot Earley in for a chat on the Sunday previous to it which in hindsight really only paid off later in the year but unfortunately the league final came too early. The venue, Sallins, didn’t really help either as it had got into the girls’ head that that pitch had become a bit of a hoodoo place for them. It must have been that night, Ballkelly raced into a 2:01 to no score lead after only 4mins before Emma Robinson would register Kilcock’s first score, a goal after 6mins. That was to be as close as kilcock would get to the south Kildare side that night though and after 15mins it was 3:04 to 1:00. Grace White (2), Emma Robinson and Noelle Conlon (both 1pt) put some respect on the board just before the break, a board that read Ballykelly 3:06 Kilcock 1:04. One thing about this team though is that they will never accept that their beaten and came out in the second half and notched up 2:04, the goals coming from White and Robinson again, the points from Robinson, White, Emma Hoare and Louise Keane. Ballykelly never really let up though and in fairness were full value for their win on a final scoreline of 4:10 to 3:08. Best for Kilcock was captain Shona Cagney in defence, Sheena Byrne at midfield and Emma Robinson and Grace White upfront. In a way this loss would serve as a blessing in disguise because if any team could bounce back up and start preparing for the championship a week later, it was going to be this bunch of determined girls and in Stone they also had a determined manager…. The future was bright. Goalkeeper Eimear Kelly was to be rewarded for her many clean sheets, brave saves and overall leadership from between the posts, with a call up to the Kildare Senior Ladies for their qualifier against Dublin and though Eimear ended up on the losing side, we would all like to wish her a big well done on her great personal achievement, some say it’s that Royal Green Blood that flows through her veins, others say it’s the experience of plying her trade in Kildare… I’ll leave that one up to urself!!! Workrate, preparation, everything was upped after that final loss. 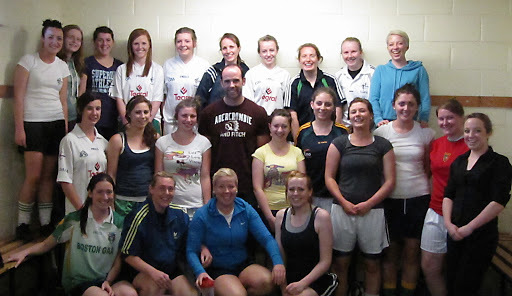 Dublin Ladies Manager Tommy Brown was drafted in for a training session and a big thank you goes to him for his time and help, to the girls he was no Dermot Earley but what he was, was a tactically astute coach that had lead Dublin to All-Ireland glory the previous summer. Challenge games were played and won against Celbridge, Naas and Na Fianna (Enfield) with a surprise defeat sandwiched inbetween at the hands of Moynalvey but in all mood in the camp was good for what was going to be the biggest month of the year. The auld enemy Na Fianna were up first at home in the championship, a championship which was again going to be determined on a round robin basis with the top four from five progressing to the semis. Once again Na Fianna were beaten as were Moorefield, the latter by 3:16 to 1:06 , again on home soil, both infront of an impressive attendance, as the Ladies challenge gathered pace, the crowds started hearing of it and came out to support!! Athgarvan at home proved tough but they were dispatched as were Kilcullen, receiving similar treatment the same week by 1:13 to 0:03.Once again the girls topped the table but maybe they may have wished they hadn’t as it meant Athgarvan were up next in the semi-final of the championship in what will go down in history as surely the roughest game ever played in Kilcock GAA. The late, great Joe Frasier would have been proud of some of the away team while the home team were more Rocky Balboa as they they took punch after punch, never once retaliating, once again true testament to their character, instead they hit Athgarvan where it hurt, on the scoreboard. 0:13 to 1:07. Looking back this game stood to them massively as no matter what was to come it wouldn’t have matched what they had just defeated. Also everyone was more prepared having just lost a final a few weeks previously. So the days leading up to the final against Kilcullen (who had defeated Na Fianna in the other semi) were much more low key, their was no big speeches, no watching dvds of old games, no Dermot Earley. The girls knew what they had to do and the management knew that too. The trust was there…. Only one small problem…. Kilcock v Kilcullen @7pm Saturday….SALLINS!!! This time round there was no be no early steam-rolling from the opposition, no surprises, no bogey pitches. After all the years of chasing that holy grail, the girls finally did it. Being honest, I was too nervous to take scores that night or a report so i’m relying on memory and some help from others. The final score was Kilcock 1:15 Kilcullen 4:03. Full back Linda Byrne was assigned the job of containing Kilcullen’s danger player for the hour and she did so, ably. Centre back Aishling O’Connor, at the tender age of thirteen, played to a level way beyond her years and was only pipped for player of the game by the magical forward Grace White, who weaved her way through the Raggettes defence on numerous occasions to score 1:03, the goal worthy of winning any goal-of-the-month competition. Emma Hoare was also in fine form scoring 6pts, while Katie Devine popped up to score 2pts of her own from wing back. Further points from Caoimhe Fagan (2), Sheena Byrne and Noelle Conlon (1pt each), all helped to seal the win on a great day for the ladies. It is hard to give everyone a mention after a win like this but everyone from Eimear Kelly down to all the subs that didn’t get a run on the night, can be proud of themselves. There was some relief when the final whistle blew, as Kilcullen were mounting a fightback but the girls held out and they along with their friends and family all invaded the pitch to embrace one and other before watching Shona Cagney accept the cup on their behalf. The years of hurt were over and as emotions ran high, grown men fought to hold back the tears.